I’ve started “swimming” semi-regularly again, which mostly involves me faffing around in the Loser Lane with foam weights and a flotation belt, because I can’t actually properly swim. Nonetheless, I’ve invented my own little water aerobics moves and sorted out a 45-minute routine, which seems to work okay for my body and doesn’t aggravate my knee. 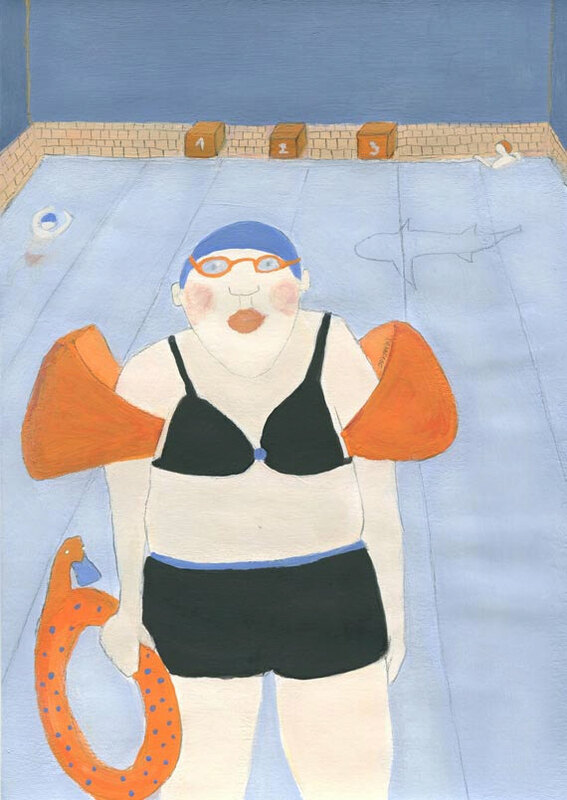 In the interest of preserving whatever muscle tone is left in my solidly middle-aged and un-athletic vessel, I’ve been considering a bold move: Getting up at 5:00 a.m. on weekdays to attend my public pool’s 6:00 a.m. lane swim. You have no idea how ridiculous a goal this is for me. Waking up at my normal time of 6:30 a.m. is a psychological fight to the death as it is, being a life-long morning-phobic night owl. But I can’t shake the idea that this is some sort of brilliant life hack that will totally work: I’ll have my exercise done and out of the way while I’m too tired to even know it’s happening, and viola! A lifetime of robust cardiovascular health and solid muscle tone is in my future. It’s the opposite of a SMART goal (Specific, Measurable, Attainable, Realistic, Timely), but I’m working up the mettle to give it the old college try anyway. Mattresses: Every day, it seems like there is some newfangled hipster mattress company coming out with The Mattress to Rival Them All. There are now at least fifteen of these on the market, and there could not possibly be a significant difference between any of them. By the way, citing “sleep science studies” and claiming to be a “system”, not a mattress, isn’t fooling anyone. They’re all mundane copycats of each other, cranking out a more or less similarly mediocre product. We’ve reached peak mattress, and I for one, am getting worried about the environmental implications of a national mattress glut. Wardrobe Services: These are companies that proclaim to send you a “curated” box of custom-picked clothing based on your responses to their nosy surveys about your personal clothing tastes. I almost tried one of these on the recommendation of a co-worker, who stood to get a cool 15% discount on her next order if I signed up. I faithfully registered and answered all of their questions, but I just couldn’t get over the emotional hump of committing, even temporarily, to clothing I hadn’t seen, touched and tried on myself first. It seemed strangely personal to have someone else pick out my clothes for me, and I couldn’t bring myself to hit “send” on my order. This led to a rash of increasingly clingy and overly-attached e-mails from said wardrobe service, wanting to know why I abandoned them and wasn’t returning their correspondence anymore. The e-mails didn’t stop until they had gone through the five stages of grief: denial, anger, bargaining, depression, and finally, acceptance when I told them I was never going to be interested in them again. As much as I hate shopping, I’ll slog off to the mall and pick out my own clothes, thanks. Yet Another Online Travel Aggregator: I used to count on one in particular that I really liked, but now it’s completely useless to use any of these. The last time I searched for a hotel package, it was a dizzying dogfight of Kayak, Orbitz, Travelocity, and at least five other aggregators I’d never heard all vying for my booking and all providing exactly the same pricing information and deals. I finally just booked directly through the resort we planned to stay at, and ended up getting the exact same price I would have gotten using an aggregator. I’m all for the free market and competition, but I’m not seeing much in the way of true originality on the product end of things these days. Indiscriminately adding more stuff to the world that is of no actual value doesn’t help anyone but the handsomely-paid marketing experts who shill them. Come on, Silicone Valley! I think we can do better. I’ll be the first to line up for your water-proof audio system, even if you name it something ridiculous, like Eerh. I think you meant to say Silicon Valley. Silicone Valley is probably somewhere over in Beverly Hills. I sympathize with your exercise boredom. That and the irritating "music" blasting at you have mostly kept me out of gyms. You can indeed buy a waterproof Mp3 player, although they are too pricey for my paltry budget. Besides, the best way to avoid boredom swimming laps is to constantly strive to improve technique, which requires intense sensory concentration on balance, kinesthesia, and feeling the water. It's like a kind of meditation.